Beauty Salon Furniture and Design - About Us | Salon Interiors Inc. Salon Interiors has been designing and manufacturing Custom Beauty Salon Furnishings for over 35 years. Styles may change but quality doesn't. Our reputation is built on pride and commitment to assist you in the journey from employee to employer. Loyalty and discretion is how we establish a relationship with all our clients. We understand that the decision to branch out is not only exciting but scary. When you approach any Salon Interiors representative it is our responsibility to keep your news private. After all it is not our shining achievement, it's yours. Whether it be your 1st location or your 10th, Salon Interiors will be with you from inception to installation. Once you have taken the step to build your salon you will look for a company that has the background and experience to make this time of transition a smooth one. This is our job, to help with conception to creation. Our valued team of highly knowledgeable and dedicated Design Consultants can guide and assist you in planning, designing, state cosmetology board requirements, ambiance and vision. Let us help bring your vision to life. This is a large investment in yourself and your craft. Quality is what you provide to keep your clients returning, we want you to feel the same way about Salon Interiors. Once you have decided to invest in your future, Salon Interiors will be there to make sure we provide you with a product that will last. 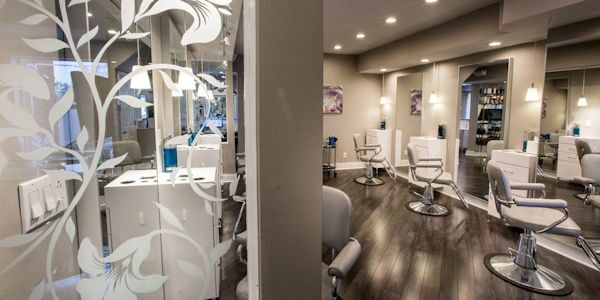 Salon Interiors has a timeless aspect that shows with our customers, well maintained Salons & Spas we outfitted 10, 20 or 30 years ago are still fully functioning today. Most Salon Equipment Companies will claim they are providing custom pieces. But at a closer look you will see very few design differences and a small sample of color choices. This is where Salon Interiors is priceless. You are unique and we believe your atmosphere should be. When you meet with a Design Consultant it is our pleasure to help you produce a look that is distinctly yours. Our showroom has tens of thousands of color samples and the design is as individual as you. When you choose Salon Interiors, you will get exceptional custom furnishings and the largest selection of representation in the world. We are the only manufacturer to establish distribution with ALL the other reputable furniture companies. Our showroom displays a hundred different pieces by a dozen different suppliers. With our showroom and manufacturing being in the same location, the Salon Interiors team can focus on quality control and attention to detail. This insures the product you receive is the same product that you envisioned. Also, you are paying it forward by spending your money on another small business enterprise. Business to business is what keeps the country growing economically. Another benefit of Salon Interiors includes a full line of plumbing parts and accessories. Over the years we discovered the difficulty of locating replacement parts and we have expanded this to accommodate your needs. Thank you for taking the time to learn more about Salon Interiors. We hope you take advantage of all the services we can offer. If we can be of any assistance in your new or existing project don't hesitate to contact us. Good Luck on this journey, we are excited for you!